Mark Your Calendars: Anna Butler is coming soon! Who is Anna Butler, you might be asking yourself? Well remember, you heard it here first. Anna is one of the most talented authors I’ve had the pleasure to read in a very long time, and in February, she is releasing two full length novels for the first time. You may have enjoyed her short story Contact Sport as part of Dreamspinners Daily Dose Anthology Make a Play. Or maybe you remember her smoking hot story Happy Holidays, from Dreamspinner’s Cuddling Anthology. A promising new author, you might have told yourself, and then promptly moved on to another story. An alternate Britain where the Britannic Imperium is an oligarchy ruled by the eight Convocation Houses and the Minor Houses, their satellite allies. A Britain where political manoeuvring involves plot, conspiracies and machination—all to get around the Queen (God bless her) having banned advancement by assassination. A Britain where the skies are filled with aeroships powered by steam and luminiferous aether, and where House Guards carry phlogiston-powered harquebuses and pistols. A Britain where Aegyptologist Daniel Meredith looks for love. A Britain where Aegyptologist Ned Winters, First Heir House Gallowglass, is recently widowed and left with two sons. A Britain where ex-aeronaut Captain Rafe Lancaster, late of Her Britannic Majesty’s Imperium AeroCorps, buys a coffee house. The rest, as they say, is the steampunk coffee house mystery-m/m romance. Anna is already planning the sequel, which is music to my ears because I can’t get enough of Rafe, the charming, dashing pilot, who finds navigating the political waters (and his love life) at home far more dangerous that battling Her Majesty’s enemies in the air. YOU WILL LOVE HIM. On February 18th, Anna will launch book one of the Taking Shield series with Wilde City Press. It is not a typical M/M romance, though the two main characters are male and deeply attracted to one another. 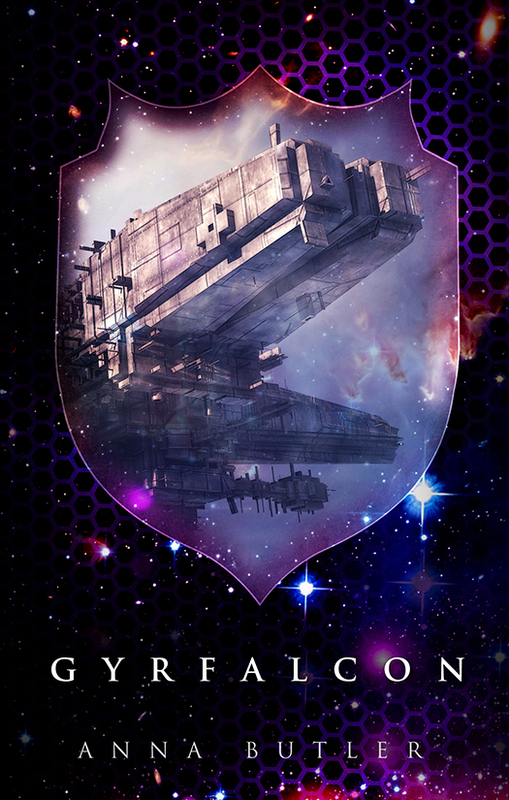 Taking Shield is classic epic space opera, in tradition of David Webber or John Ringo. It’s hard-core military sci-fi at its finest. Earth’s dead, dark for thousands of years. Her last known colony, Albion, is fighting an alien enemy that no one has even seen. In Gyrfalcon, the first of the Taking Shield series, Shield Captain Bennet is dropped behind the lines to steal priceless intelligence. It’s a dangerous job, and Bennet doesn’t need the distractions of changing relationships with his long-term partner, Joss, or with his father—or with Flynn, the new lover who will turn his world upside-down. He expects to risk his life. He expects the data will alter the course of the war. What he doesn’t expect is that it will change his life or that Flynn will be impossible to forget. All the warning he got was the slightest prickling of the hair on the back of his neck, then someone or something forcibly connected with his legs and brought him down. The impact had that foul-smelling air whooshing out of his lungs. Flynn tried to catch his breath. Bennet, arms and legs wrapped around him, rolled them both into the shelter of the rock that he’d evidently been hiding behind. For an instant they lay in the warm darkness, wrapped together. They were in deep shadow, and Flynn had to feel for Bennet’s face to touch it, to make sure that the Shield captain was really there. His hand found Bennet’s mouth, felt it curve into a smile, and he smiled himself. Bennet disentangled himself, so that Flynn was undistracted again. Huh. Shame. Bennet had felt pretty good. He inched up to peer carefully around the rock. The two drones were about fifty feet away and marching towards them. They rolled in opposite directions from behind the rock. Flynn fetched up on his knees, bringing up the laser and firing several sharp short bursts. His drone staggered and fell onto its back, dropping the laser rifle it was holding, its circuitry fried by a plasma bolt to the head. The remaining one stood rigidly still, sparks shooting out from its chest circuitry. In an awful travesty of a human reaction, its hands were clawing at the hole in its chest. It toppled slowly over onto its face. Anna worked for many years as a communications specialist in the UK government, working in a range of central government departments on everything from marketing employment schemes to running an internal TV service. She now spends her time indulging her love of old-school science fiction featuring handsome heroes running about shooting lasers. She doesn’t claim to be a romance writer – that her laser-wielding heroes are gay and their relationship is a real one are both integral to her Taking Shield series, but not the reason for it. When she isn’t writing, she looks out at her garden thinking that she really should get out there and tackle the weeds, but is easily distracted into building up the biggest collection of tiara images on Pinterest instead. She lives in London with her husband and Molly, the cockerpoo. This entry was posted in Uncategorized and tagged cover art, Dreamspinner Press, promo, Sarah Madison, upcoming release, writing by Sarah Madison. Bookmark the permalink. Both of those books sound amazing, and I will be purchasing them as soon as they come out. The name Anna Butler is so familiar, though as a rule I don’t read short story m/m, so I’m not sure from where. Hmmm. Sarah Madison recently posted..Mark Your Calendars: Anna Butler is coming soon! You are the most supportive and loving of people, Sarah! Thank you for this lovely boost to my ego. I am so excited about both books, but I don’t in any way underplay the help and encouragement I’ve had from you. Without you, Rafe wouldn’t sparkle nearly so much, nor Bennet and Flynn be as real and compelling. I can attest to how absolutely frigging marvelous the Rafe book is AND the Shield series. Both are tour de forces in completely different ways! Between you, you and Sarah are likely to turn my head! Thank you!